Head out to Trinidad Head today for a rare public glimpse of the Trinidad Lighthouse — a treat for people who love lighthouses and/or hate crashing into rocks. The lighthouse is changing hands — the Coast Guard is transferring the property to the Bureau of Land Management — with a ceremony today featuring docent-guided tours and presentations from Native American dancers and the BLM. That’s the active Trinidad Head lighthouse, on the west side of the rocky outcropping — not the lighthouse on Trinity Street overlooking Trinidad Bay. Details are still being worked out, but the BLM plans to hold open-lighthouses more frequently in the future. The ceremony starts at 12:30 p.m. and the BLM recommends you show up early. 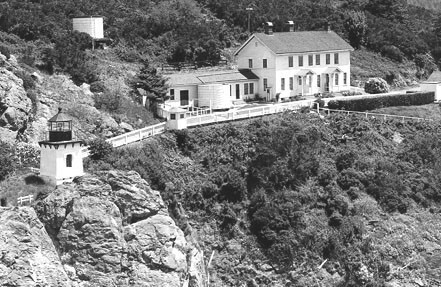 The Bureau of Land Management and United States Coast Guard, along with numerous Trinidad community partners, will celebrate transfer of the Trinidad Lighthouse from Coast Guard to BLM ownership in a ceremony at Trinidad Head Friday, May 16. This ceremony is related to the active lighthouse on the west edge of Trinidad Head, not the well-known Memorial Lighthouse, a replica of the original, on Trinity Street in Trinidad. When: The ceremony begins at 12:30. Arrive early, as parking will be congested and there is a half-mile walk from the parking area to the dedication site. Who: BLM State Director Jim Kenna will be joined by representatives from the U. S. Coast Guard, California State Parks, the Six Rivers National Forest and Trinidad community leaders. They will discuss the lighthouse transfer and other partnerships aimed at conserving California's Coastal Resources. Other events: There will be presentations by local Native American dancers and Trinidad children. Trinidad Museum docents will lead walks to the lighthouse. There will be photo and video opportunities during presentations and the guided walks and interview opportunities with BLM, Coast Guard, Tribal and community leaders.